In 1986, the late John Hughes gave film audiences one of his most beloved teen dramedies — and teen heroes. Filled with memorable scenes, zippy one-liners, and a motley cast of characters, Ferris Bueller's Day Off is an '80s film that not only stands the test of time, but helped define a genre. Pretty brilliant for a story that spans a mere eight-hour time frame and is all about a group of teens playing hooky from school. But watch this classic again as an adult, and you realize that more than a few parts of the movie require a serious suspension of disbelief. 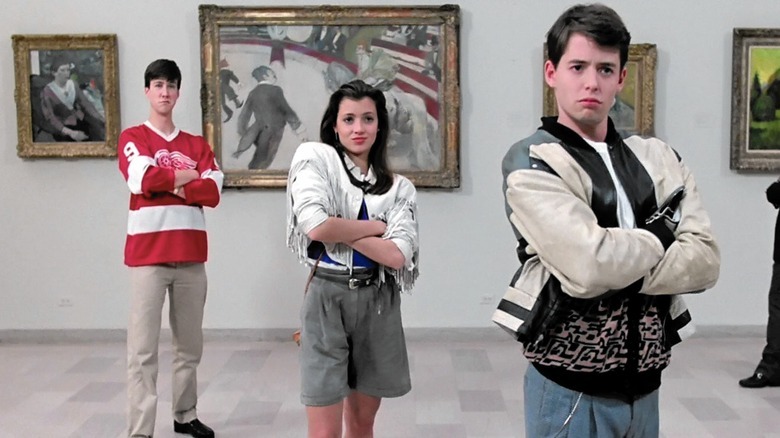 From unwitting adults to seemingly other-worldly timelines, there are more than a few occasions when you just have to admit that Ferris and his friends had very little chance of actually making this ultimate day off happen. Ferris and his buds pack a whole lotta livin' into that one day off from school. But did they really have enough time to experience it all? Let's break it down. Figuring in the amount of time Ferris spends at home waiting for Cameron to finally come and fetch him, plus the effort it takes to cook up the elaborate scheme to get Sloane out of Mr. Rooney's lair, we have to imagine it's at least 10AM by the time our heroes are off to Chicago. They manage to park the car, visit the top floor of the Sears tower, discuss life while traders and brokers make and lose millions at the Chicago Board of Trade…and that's all before their fancy lunch at Ferris' dad's favorite restaurant, Chez Quis. After lunch they take in a Cubs game at Wrigley field, admire fine art at the Art Institute of Chicago, and cap off their time in the city with a ride on a Van Steuben Day Parade float. Then it's a leisurely drive to the beach where they attempt to console a distraught Cameron, take him back to his house for a soak in the pool, and only then begin the arduous task of taking the excess miles off the Ferrari. One dead car later, along with Cameron's teen catharsis, Ferris drops Sloane at home, and begins the race back to the Bueller house to greet his family at 6PM. And they did this all without Uber? Ferris may have gotten a computer instead of a car, but it's hard to feel too sorry for a high school senior who has a room packed with such cool stuff. While the tech Ferris was enjoying in his own personal teen cave might seem pedestrian by today's standards, it all came with a pretty hefty price tag in the '80s. From his record collection to his totally boss stereo to his hacker-level IBM computer, Ferris has a bedroom that would make him the envy of any '80s teen. And when he's not getting down on the clarinet or his classic Gretsch White Falcon electric guitar and Fender amp, he's rigging his state-of-the-art video camera to his closed-circuit video monitor and cleverly rigging his family's doorbell-slash-speaker system. But of course, everybody's favorite of Ferris' toys is the keyboard synthesizer he uses to make convincing fart and vomit sound effects while rallying the troops at school. But that's no ordinary synthesizer Ferris is using — it's an E-mu Emulator II, the creme de la creme of synths used by '80s bands like Depeche Mode. It would have set Ferris' parents back about eight grand, which makes you Ferris could have easily pawned it and bought something to compare to Cameron's Alfa Romeo that he was apparently so envious of. But Ferris isn't done with the wardrobe department yet. His hat gets tossed in the air as the team speeds away from Shermer High School in Cameron's dad's Ferrari, but that doesn't explain what happens to Ferris' suit and trenchcoat on the drive to Chicago. When they arrive in the city, Ferris is outfitted in his sweater vest, white tee, and leather jacket. If that suit and coat were in the trunk of the Ferrari, then they ended up sitting in a ditch in Cameron's backyard, because we never see Ferris bringing anything home at the end of his adventure. We've already determined that Ferris and his friends are pretty adept at packing a lot of action into a short timeframe. But unless this film included a time machine scene that was left on the cutting room floor, there's really no accounting for how they managed this next feat. Early in the movie, Ferris and Cameron make their phony phone call to Ed Rooney and come to a disagreement about how to handle picking up Sloane at school. To Ferris' dismay, Cameron (as Sloane's dad) blurts out that Mr. Rooney should have Sloane outside the school in ten minutes, and that Mr. Rooney better be standing there with her. This leads to a spat: Ferris kicks Cameron, Cameron storms off, Ferris delivers an emotional apology, and the two are chums again. They then travel all the way back to Cameron's house, where Ferris convinces Cameron to "borrow" Cameron's dad's vintage Ferrari. They secure the vehicle and travel all the way back to Shermer High, just as Mr. Rooney and Sloane emerge. We don't know what these dudes ate for breakfast, but we totally want some. We may not know all that much about Cameron's elusive and wealthy parents, but the one thing we do learn is that Cameron's dad loves his prized collection of vintage cars — maybe even more than he loves his own family. And the jewel of his collection is the red 1961 Ferrari GT Spyder that Ferris, Cameron, and Sloane take joyriding into Chicago for the day. So if a wealthy man cherishes his car collection that much, it would only stand to reason that he'd keep it on lockdown. You'd expect pretty tight security in the museum-like house where the Fryes live. Except Cameron's dad has housed his car collection in an unlocked garage, with giant, completely see-through glass walls. Oh, and he also left the keys in the ignition. Kind of makes you wonder why Cameron doesn't just say the garage was broken into instead of admitting he trashed the car himself. Here's another reason that there must have been a time machine in Ferris' bedroom along with the rest of his gear — or at the very least a transporter whisking the gang where they needed to be throughout their eight hours of hijinks. We know Sloane and Cameron weren't privy to Ferris' elaborate plan to bust Sloane out of school. Yet part of the plan hinged on Cameron's answering machine playing an outgoing message that told callers they'd reached Coughlin Brothers Mortuary — the same funeral home where Sloane's answering machine said the family could be found during her grandmother's services. But when did Cameron and Sloane record those messages? Earlier in the day, before they knew the plan? Was it a lightning fast stop at the Frye and Peterson homes while the teens jetted off to the city? Even worse, what happens when other people call Sloane's number…like her grandmother? Sloane Peterson was the kind of '80s movie girlfriend that made girls wish they had that fringed leather jacket — and made boys wish they had a girlfriend with a British accent who went swimming in a silk negligee. But there are a couple of things about her that might leave you scratching your head when you watch the film as an adult. The biggest mystery? How seamlessly she goes from utter terror that Ferris' dad might spot her with the crew on the taxi line at Chez Quis to nonchalance about making kissy faces to Mr. Bueller just a few minutes later from the backseat of the taxi cab. Sure, she has those Ray-Ban sunglasses on as a brilliant disguise, but even perpetually oblivious Mr. Bueller must recognize his son's serious girlfriend. Considering Ferris proposed to Sloane back at the Stock Exchange, things might get pretty awkward at the wedding. The Von Steuben Day Parade is a very real event that graces the streets of Chicago, New York, and Philadelphia each year. What's not real? The chance that the organizers would allow a fast-talking 17-year-old from the 'burbs infiltrate one of the parade's featured floats just because he wants to show his buddy a good time. Why was a live mic available on the float? Did Ferris steal it from the person who was supposed to actually MC? Good thing Ferris conveniently knows every lyric to the two songs he masterfully lip syncs while he's up there: "Danke Schoen," which is referenced three other times in the film, and the Beatles' version of "Twist and Shout," which is a rock 'n' roll classic but seems oddly out of place in a parade celebrating German American culture. The cops won't let Sloane and Cameron approach the float when they try to talk to Ferris, which makes sense. But cut to just two minutes later and all bets are off as the entire crowd surrounds the float to shake their moneymakers on Dearborn Street. Guess the cops were changing shifts. Aside from a quick visit from Mrs. Bueller to check on an ailing Ferris, and Ferris' sister Jeanie's time at home when she kicks Mr. Rooney in the face and huddles in her bedroom to call the police, the Bueller home is mostly empty for the day while Ferris enjoys his time off. Yet when everyone comes home at 6PM, the hallways are filled to the rafters with the balloon and flower deliveries sent by the entire town to wish Ferris a speedy recovery. So who accepted all those deliveries? It couldn't have been Jeanie — in fact, we see her slam the door in the singing telegram nurse's face. And it likely wasn't Mr. Rooney, because the one vase of flowers we saw him pick up ended up on the head of the family's Rottweiler. Does Ferris have a robot butler hidden upstairs in his bag of tricks? Ferris Bueller's Day Off is loaded with brilliant moments and immensely quotable lines, but the fun doesn't stop with the story — in fact, this is one of the few films whose end credits include some of the best parts. Who doesn't love seeing the disheveled and broken Mr. Rooney accepting a warm gummy bear from his bespectacled bus seatmate, set to the unforgettably catchy strains of Yello's "Oh Yeah"? But when you watch it again as an adult, you realize there's something peculiar about that schoolbus filled with teens pulling up to Mr. Rooney and asking him if he needs a ride. We know it's now long past 6PM, and those kids should have been home hours ago. Is the bus driver lost? Or did Mr. Rooney wander onto the set of the wrong movie?